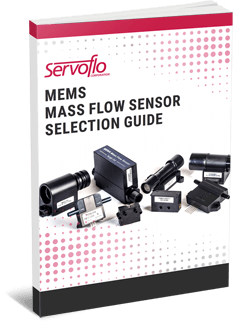 To obtain accurate, precise flow measurements, it’s critical to select the proper MEMS mass flow sensor for the specific application at hand. When choosing a flow sensor, accuracy, sensitivity, and size should all be kept in mind, along with a range of other key factors. Flow sensors play a crucial role in many different applications and industries, such as chemical and semiconductor manufacturing, medical device manufacturing, and natural gas metering. Operating independently of density, pressure, and viscosity, these devices generally consist of upstream and downstream temperature sensors and a heater located between them. When selecting a MEMS thermal flow sensor, the following measurement considerations should be kept in mind: mass flow rate vs. volumetric flow rate, mechanical flow channel diameter vs. flow rate, and the nominal operating flow rate of the products. MEMS flow sensing products typically measure the mass flow rate, which is automatically compensated for changes in temperature and pressure. Mass flow rate always is referenced in relation to the standard condition of a specific temperature and pressure. The reference pressure is typically 101.325 kPa, or 14.5 PSI; the standard temperature may vary, at 0°, 15°, or 20 °C. The manufacturer will specify the conditions in the user manual. The default reference temperature for current Siargo products, for instance, is 20 °C, which can be customized upon request. All flow measurement products are packaged with a flow channel to ensure optimal performance; therefore, it’s critical to select the proper flow channel for the desired flow rate measurement. It’s generally not recommended that users measure a high flow rate in a small channel or a small flow rate in a large channel. Also, the product’s flow channel should not be connected to a different size system channel. However, if there is no option but to alter the flow channel size, the product’s flow channel size should always be smaller than that of the system channel. 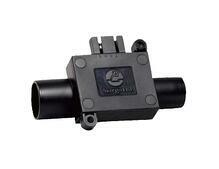 Flow sensors normally have about a 20% margin for the specified full-scale flow rate. However, it’s recommended that users select a full-scale flow rate that falls within the application’s maximum flow rate in order to ensure optimal performance and reliability. When dealing with low flow rate accuracy, sensor products have a default range of over 100:1, allowing them to meet most applications’ requirements. Most of today’s products do not offer a bidirectional flow rate measurement option, but this can be customized as needed.